IPL Skin Rejuvination- Restore your skin back to flawless! UP TO 8 SHADES LIGHTER – USUALLY $179 NOW JUST $99 for the month of July Only! BleachBright has developed a new technology for tooth whitening that works at the speed of light. With only one 20 minute process your teeth will be brighter from two to eight shades! Create a positive attitude for yourself and improve your appearance while achieving a more youthful look with your new radiant smile. 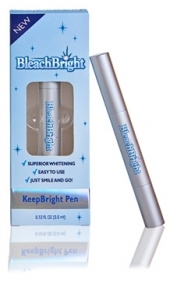 BleachBright tooth whitening is not a medical procedure and is a safe product. A typical BleachBright treatment can brighten your teeth up to eight shades whiter. People with heavily discoloured teeth will notice a remarkable difference. Those lucky enough to have white teeth can achieve an even whiter smile with the BleachBright treatment. The BleachBright procedure is SAFE, EFFECTIVE AND PAINLESS. The procedure itself is SIMPLE and self administered. We use a breakthrough product that was developed in Europe. The double sided mouthpiece has a special whitening agent and other essential ingredients. All you have to do is simply insert the mouthpiece so it is pressed firmly against your upper and lower teeth and SIT BACK AND RELAX. Our spectrum blue LED is positioned so that it focuses its energy directly onto the mouthpiece. The mouthpiece acts as a lens which activates the whitening agent within and brightens your smile. The key to the success of our whitening system is our patented blue light technology, which increases the potency of whitening in a fraction of the time and cost compared to other techniques avaliable. 2.How long will the process last? Two to four years is not unusual. Research has shown that if the teeth and gums are normal and healthy there are no adverse effects to the bleaching of one’s teeth. 4.Who can benefit from the BleachBright system?